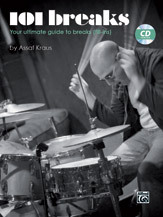 This book was written with both beginner and advanced drummers in mind, and is meant to enhance the technical skills of the drummer through melodic breaks (fill-ins) and various drumming techniques. There are 101 breaks in this book in many different styles (hip hop, trip-hop, rock, jazz, funk, blues, and more) and different time signatures (4/4, 2/4, 6/8, 12/8). This book was carefully designed to convey its content in a simple and straightforward way. You will find yourself free of old, confining drumming patterns, and inspired with your own, new, creative ideas that will fill you with the joy of music.